Entertaining and educational activities focusing on the ocean and its creatures. 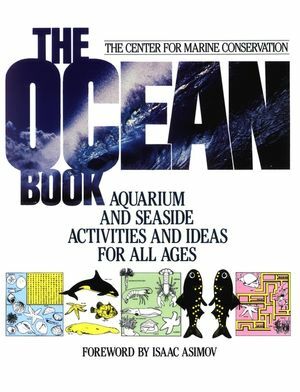 The Ocean Book Aquarium and Seaside Activities and Ideas for all Ages This activity book on the world of the oceans and the living things that inhabit them is filled with experiments, investigations, puzzles, games, and all sorts of fun things to do and learn. The activities were created and contributed by the leading aquatic centers in the United States, including the National Aquarium in Baltimore, the Monterey Bay Aquarium in California, Sea World in Ohio, and many others. The activities are designed to teach by doing, and each one has a high entertainment value. Just a few of the topics covered in The Ocean Book include: Whales Seals Sharks Tides Camouflage Fish Sea Turtles Coral Reefs The Ocean Floor Sealab All the activities are ideal for grades K-6, but older children and adults may just learn a thing or two as well. THE CENTER FOR MARINE CONSERVATION (formerly the Center for Environmental Education) was founded in 1972 as a private, nonprofit organization to increase public awareness and understanding of the relationship between people and the marine environment. With more than 100,000 members worldwide, the Center for Marine Conservation is the leading nonprofit organization dedicated to protecting marine wildlife and their habitats. Dive In: The Beginning of Your Ocean Study. Currents, Weather, Waves and Tides: The Ocean at Work. Who's Who: Animals in the Ocean.